I am fortunate to live near Clanton, Alabama, where the most scrumptious peaches are grown. It is always a special treat to get a basket of delicious peaches from one of the growers. When peach harvest occurs, there are two things I look forward to: Peach Ice Cream and Peach Cobbler. Peach Ice Cream is one of my favorite ice cream flavors. When I was growing up, preparing it from scratch meant the hand-cranked ice cream freezer would be brought out for the ceremonial ice cream making. 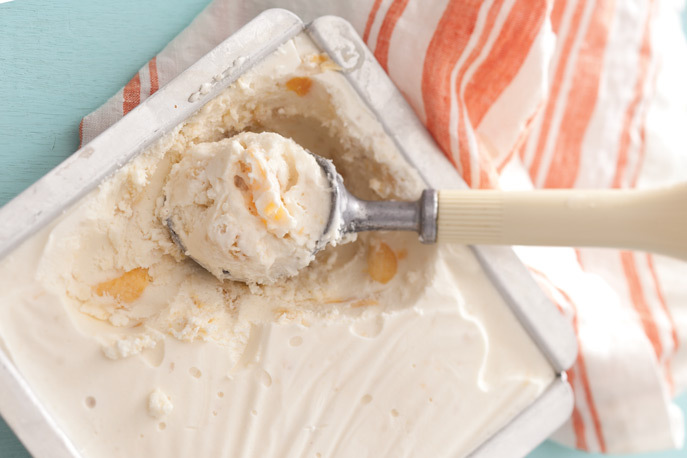 Combine two of my favorite summer desserts with this recipe for Peach Cobbler Ice Cream from the July/August issue of Taste of the South! Mom would stir up the “mixture,” and Dad would gather the ice and rock salt. With each turn of the handle, we were one step closer to a wonderful surprise. We all took turns at the crank, but Dad did the bulk of it. And we were all on red alert to keep the salt water from seeping into the canister containing the ice cream. Those were fun days. Today, the sound of the electric motor turning the crank is music to my ears. There is nothing more wonderful than taking out the canister of ice cream, lifting the lid, and savoring every spoonful of ice cream. My brother, sister, and I would always get the ice cream brain freeze from consuming ours so quickly. Tell me about your favorite ice cream memories. I Love Peach season. We live in South Carolina and we are just as much a peach harvest state as Georgia is. We just went to the orchards of a friend of ours and picked about 2 bushel of fresh sweet peaches. My favorite peach cobbler recipe is one of Paula Deen’s. I have a peach ice cream recipe from my mother and it has the best ingredients ever. Made both cobbler and ice cream with the grandchildren and we all enjoyed it so much. Have some peaches in the freezer for later to enjoy cobbler and ice cream again soon. Thanks for reminding us of how blessed we all are for the simple things we can enjoy together. My Grandaddy Carman would take a big block of ice and put it in a gunny sack and with the flat side of an ax, he would break that ice up in that old gunny sack, mix in a little rock salt…then use it in an old ice cream freezer…filled with fresh milk and Grandma’s recipe. I still love homemade ice cream but that’s not what I’m craving a taste of right now. We grandkids would help replenish the ice in the hand-crank freezer while Grandaddy was turning it…my Dad and uncles would take turns helping him crank at times. We kids would sneak some of that ice while we were “helping” or playing with cousins close by. I can smell and taste that combination in my mind right now and that has got to be one of the best smells and tastes in the world…strange as that may seem to everyone else. How wonderful it would be to go back in time and sneak some of that “gunny-sack ice” again and experience such a wonderful time of family fun and fellowship…reminds me of words from an old song…”precious memories…how they linger…how they ever flood my soul”…Blessings! Living in the cold (It’s July 21 and it’s 48 degrees outside) North Atlantic province of Newfoundland and Labrador, where peaches are always imported, I can only imagine what fresh peach ice cream tastes and smells like. Heavenly I’m sure. Enjoy! how can I order the Birthday celebration cake magazine? It was featured about a month ago. thank you. The store has everything we offer. Thank you. If you have any trouble please let me know. 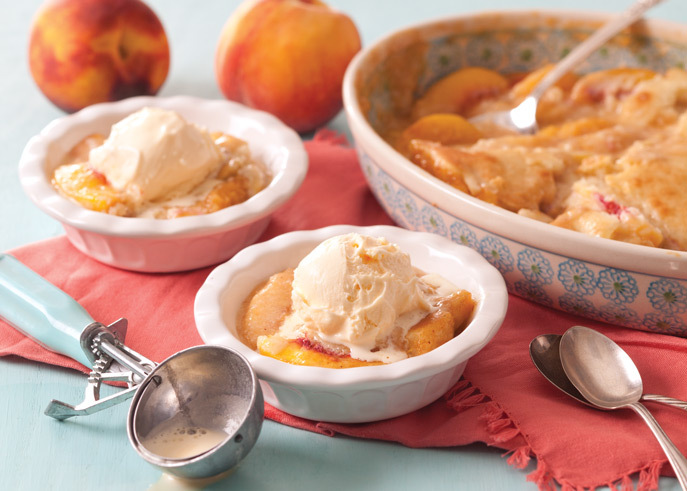 Dear Phyllis, Peach Cobbler with Peach Ice Cream can it get any better? Oh, do I have some shopping to do….you made my day! I love peaches! I loved your piece with April Cornell. I immediately ordered a beautiful table cloth. Thank you so much for leading me to that. i love peach ice cream, but i, also, love peach cobbler. i use to have the best cobber recipe written on the page of a favorite cookbook, and now i have lost the cookbook. can we get your cobbler receipe too. love your blog can har each day to receive it, and when it is not there, i am soooooo disppoined. Clanton peaches… nothing sweeter and juicier! We are about 1.5 hours away but get the benefits of their bounties a couple of times a week. They drive their fantastic farm truck into our small town loaded with baskets of fragrant jewels. So far this summer, we’ve made a couple of drums of peach ice cream, peach and cream scones, fresh (of course) and before we lose any, I cut and dice some to put in the freezer. Frozen peaches make for an excellent way to keep your white wine cool in your glass. Just a few pieces (frozen) and it stays cold till you’re done then you can enjoy the sweet infused fruit afterward. Sweet wines are the best! ice container. It was fun to spin the can back and forth. The ice cream was delicious. This was a wonderful childhood memory but I am glad we now have electric freezers. I never met an ice cream, I DIDN’T like, however, my mom would make the most spectacular homemade ice cream! When I was a kid, we had the hand crank ice cream maker, and my sister and I would want to crank it, until it became too stiff for us. Then, Dad would have to finish it. Now days, I have the same style, with the wooden bucket, but it has an electric motor. It is one of those things that requires some effort, but it is a “labor of love”. It really is one of those joys of summer! My favorite memories of making homeade ice cream took place at my grandparent’s farm in Wellsville, Missouri. My grandmother used fresh cream from the dairy cows on the farm. Eagerly, I watched her make the ice cream and wrote down the recipe as I watched her cooking the custard before freezing it. I must have been 9 or 10 at the time. My grandfather and uncles would churn the ice cream crank. I still use her recipe religously, and my friends and relatives believe it to be the best custard ice cream they have eaten. Summer memories have always included peach cobbler and peach icecream and more peaches ! My husband just returned from SC and brought a bushel of fresh peaches. After sharing with my neighbours and making a cobbler, Bob and I are going to make a run of peach ice cream this afternoon late. Your family history parallels mine so much. We were and are so blessed to have these memories and traditions. I notice you display one of those old scoops that worked so well. I still have mother’s. Mother is in a skilled nursing facility and sometimes I share your stories with her. She will be 90 on Friday. I enjoy everything you write and absolutely loved the Cornell interview. Blessings to you. My summer ice cream memory was going to our cottage in Minnesota and having my dad take me into town to the old fashioned drug store with the counter where you could get a real chocolate malt made right in front of you. Every chocolate malt I taste takes me back to those perfect summer days with my dad. I have favorite Summer memories of growing up on my grandparents’ farm and on a hot day asking my mother if she would make lemonade. Maybe ce cream, too. Her answer was usually, “If you can find some ice in the icehouse, I will.” With that encouragement, my sister, my brother and I would race to the icehouse and dig furiously in the sawdust for an ice block. We usually were successful then couldn’t wait to turn the freezer’s crank, lick off the dasher and eat a bowl of Summer’s best treat. 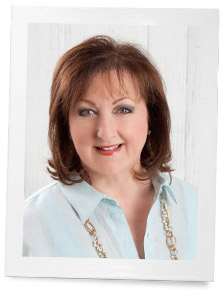 My memories of homemade ice cream are very similar to yours, Phyllis – including the salt water alert! I remember going to the icehouse with Daddy to get the 25 or 50 pound block of ice, depending on how many churns were going to be cranked. Peaches were abundant in our area – often from our own few trees – and with or without fruit, Mother ALWAYS added Adams Best Vanilla. Pulling out the dasher was important & scraping it was a ritual not to be missed. One of the first “socials” we held as newly-weds was an ice cream making evening where guests brought their favorite ice cream ready to be cranked and then shared and savored. My grandparents would take me to a summer resort for 2 weeks every summer. I can still remember the home made sour cherry coffee cake that would be topped off with the most delicious vanilla ice cream. Yum, I can still remember the treat some 40 years later! Oh, what wonderful images you’ve provided. I’m only sorry that you didn’t include the cobbler and ice cream recipes too. I have my own, but it would have been delicious to try yours!